Piece O' Cake ~ easy to learn ~ delicious to play game ~ high quality pie-shaped cake tiles. In this lite strategy game you will create 5 cakes each with eleven slices consisting of a combination from 8 flavors. Each player will have a turn at being the "server" and dividing their cake as they wish. But keep in mind as the "server" you will get last choice of the divided up cake. From each divided cake you will choose to either keep your slices or to eat them immediately. While eating them immediately guarantees a number of points, collecting them may score you bonus points if you have the most of that variety at the end of the game. So grab a fork and let's start eating cake! 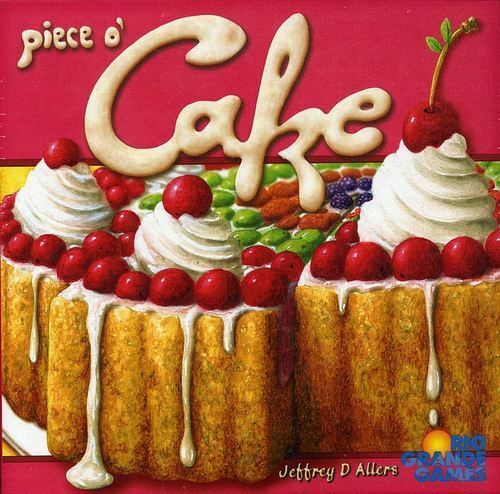 Come on in we have a demo copy of Piece O' Cake open for you to try. We'll be happy to teach you the rules while you're here in the store. And, if you didn't already know, we have tables available for you to sit and play not only Piece O' Cake but any of the games on our demo copy shelf. At Off The Charts Games, we have a fabulous selection of family games, strategy games, Euro-style games, war games, card games, and dice games. We proudly serve Gresham and the greater Portland and Vancouver area. Discover Board Games and Discover the Fun!